UPSC has released final result of Combined Medical Services Examination, 2018 at its official website. Union Public Service Commission has declared final result of Combined Medical Services Examination, 2018. 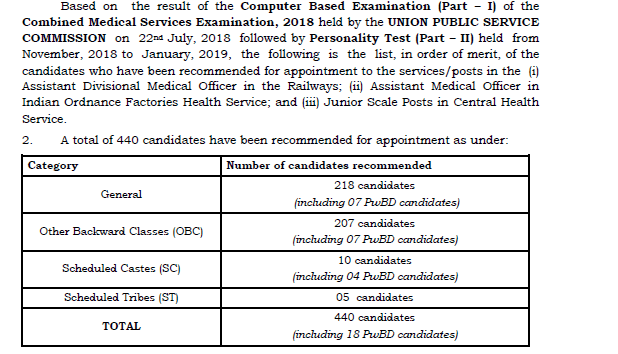 Candidates who appeared in the examination can check their result at official website of the commission. . Based on the computer based exam conducted by the Union Public Service Commission (UPSC) and the personality test, a total of 440 candidates have qualified the Combined Medical Services Exam 2018. 504 vacancies were proposed to be filled up through the exam. The provisionality of these candidates will remain valid only for a period of six months from the date of declaration of Final result," said the Commission.